I have a question I`m sure someone on here can answer. I found a stand for my slot machine but I could not figure out how the part that holds the slot machine in place comes loose to take machine off. I sent the picture of it. I found there is no door to get into it and the only thing I could think of was the hole that I thought was from a missing lock is where a tool goes or something. I tried to fish back in there with a screwdriver but I could not feel anything and I didn't have any other tools with me. Also what does one of these stands usually go for? 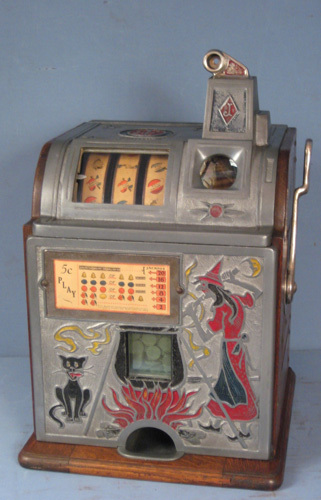 The reason I ask is the women that has it wants to sell the slot machine and stand together and I got her down to $300.00 The slot machine is not great, the case is cracked & someone tried to weld it so it`s junk. (Picture) I got the machine to work after awhile but it runs through really slow. (Maybe in bad need of cleaning?) It`s also missing the cash box but on the good side it does have the original back door, lock, matching key. It also has the original coin box cover lock & key. I do need the back door if it fits an old poinsettia slot and if nothing else I can part the rest out. So It sounds pretty good if the stand is worth something half way descent. Thanks! Thanks! I`ll go get it but I still need to know how to unclamp the machine off of the stand so I can carry it up a flight of stairs. Remove the back panel from the stand and the bottom of the slot was screw to the stand. Not sure on your metal stand but the Original Mill's Metal Slot Stands had the Mill's lock in the middle as shown in the picture below with a hole on both the left and the right side that an Allen wrench would go into to tighten and to firmly grasp the slot machine cabinet base in the metal stand and additionally on location in them thar old days the route operator would place a sand bag or two in the base of the metal stand to keep someone from walking away with the slot machine! Never saw a Jenning's metal stand in 35 Plus years but now Thanks to you I can say I have! 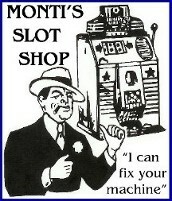 Thanks for posting, from one old slot man to another! Rich, This cabinet does not have a panel. Monti, The cabinet is not like the one in your picture. OldSlotMan, You hit the nail on the head. The only thing I can`t figure out is there like a flat head screw in the hole or is it more like a screw shaft you have to turn? ...Thanks to everyone for your inputs! I have my Jennings stand pictures, hopefully they help. A flathead screw slot is behind the lock hole, when turned the threaded rod moves to the opposite site (front) of the cabinet allowing the steel rod attached to the rear locking portion of the cabinet to move backward, allowing removal of the machine. Mine was rusted but is now working smoothly, getting ready for cleaning and painting.